Delirium is a sudden change in a person’s mental state. It is a serious condition that is sometimes mistaken for dementia or, more rarely, depression. Treatment will depend on the underlying cause and should be managed by a healthcare professional, such as a GP. Most people living in care homes will be at risk. 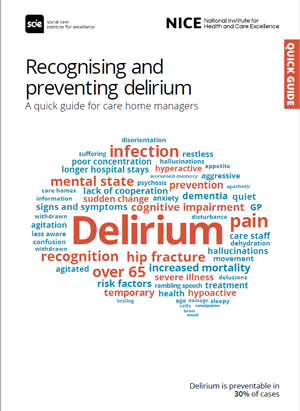 Care staff have an important role to play in looking out for any changes and providing support to reduce the risk of delirium occurring. Makes a person restless, agitated, aggressive. Mixed delirium occurs when the person moves between the two types. Makes a person withdrawn, quiet, sleepy. The severity of symptoms can vary during the course of a day. If any of these changes occur, an assessment from a healthcare professional (usually the GP) should be requested. Make sure support is provided by carers who are familiar to them. Avoid moving the person unnecessarily, and keep their surroundings familiar. Request a review if they are taking multiple medications. Check on admission, and then daily, for any changes that might indicate delirium and refer for an assessment if needed. Factors that make delirium more likely are listed below, with steps to help reduce the risk. Make sure the person can see a clock and calendar. Talk to the person to help orientate them. Encourage the person to drink. Support the person to avoid/address constipation. Look for signs of infection. Avoid using a catheter as far as possible. Avoid disturbing the person during sleep periods. Encourage the person to walk. Provide support to do a range of active exercises, even if walking isn’t possible. Look for signs of pain, particularly if the person has a learning disability or dementia (Abbey Pain Scale is a tool that might help with this). Make sure pain is well-managed. Make sure any dentures are clean, being worn and fit well. Look at the advice in ‘Nutrition support in adults’ (NICE guideline 32). Being well-informed may help reduce any distress for the person and their family. how other people with delirium have felt. The public delirium information leaflet from the Royal College of Psychiatrists may be helpful.